With most of our Bass fishout buddies in Mexico, we were only able to get 4 people down to Kelsey Ranch this past Saturday for our Fall bass fishout. We didn�t have the overcast weather like last year at this time so the fishing was slower than normal. David Harris and I drove down together and were met at the lake by Alan Fisher. Rich Palmini arrived a little later. 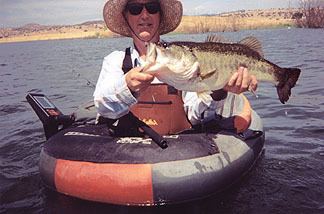 We all would be float tube fishing with barbless hooks. Most of us tried various patterns including popper and especially sinking flies because most of the fish were on the bottom. I am a "dyed in the wool" popper fisherman for bass, so I spent the whole day right till dark fishing with my frog poppers. I had a fairly productive day with 20 fish landed and a few that got away, including a very big fish that broke off my 10 lb. test tippet. I worked the edges of the pond all around the areas where we launched over to the dam. As it got late and the light got less on the water, the fish really started to hit my popper. I cast under a tree and popped my frog a few times. A big swirl at the popper and I was into a big fish. He dived into the weeds and tried to get me really wrapped up. I had to get my float tube over near the fish and had to get my line in by pulling it in by hand. After each foot of line I pulled in, I had to pull away the weeds from the line. Finally my leader was at hand with a lot more weeds. As I pulled the final pile of weeds off my line, I saw a big bottom lip attached to my popper amongst the weeds. I grabbed that lip and pulled out a beautiful 21" bass that had a huge belly. I wish I had a scale at that time because it was my biggest Kelsey bass. It wasn�t as big as the 9 lb + bass that David Harris caught there in May, but it was a nice fish to cap off a good day of fishing. Allan got into a few fish. One was a nice 19" bass. David landed around 15 fish, caught with various patterns including some poppers. Rich Palmini was giving bass fishing his first try this year. Allan Fisher had to get home early so he left around 5 PM. The rest of us fished till dark. David and I spent the night in Modesto with plans to explore on Sunday. Rich Palmini camped at Lake Don Pedro (good hot showers). We planned to meet on Sunday. David and I had a great dinner at R. J. Stillwaters on 9th St in Modesto. Allan told us about the place and the menu. He mentioned having a mixed grill of venison, quail, antelope sausage, and lamb chops. We tried to order it but they were out of venison, so for that portion they substituted a small filet mignon. We enjoyed our dinner then had a good nights sleep. We went up to the Stanislaus River the next morning hoping to do some fishing. Surprise!!! They closed the Stanislaus to all fishing on the previous week-end to protect the spawning salmon. Had a great salad lunch at a little park near the river near Knights Ferry. Watched the spawning salmon from the bridge. We found a pond off Orange Blossom Road near Knights Ferry. We fished it for a few hours but it was too weedy. It would be better to try it in the spring with the weeds down. We drove over to Tulloch Lake and Woodward Reservoir to see if they were our kind of lakes. � Pass on them. We headed home earlier than normal. Had a pretty good week-end for our last bass fishout this season. Time for me to get out my calls and get ready for duck season. Time to collect more duck feathers. Tight lines to you all, especially to those who braved the southern area and caught fish in Mexico.